So Mom, who goes to a Burlesque Xmas Performance and spends the evening in the hallway chatting away with one of the vendors? I do, I do. 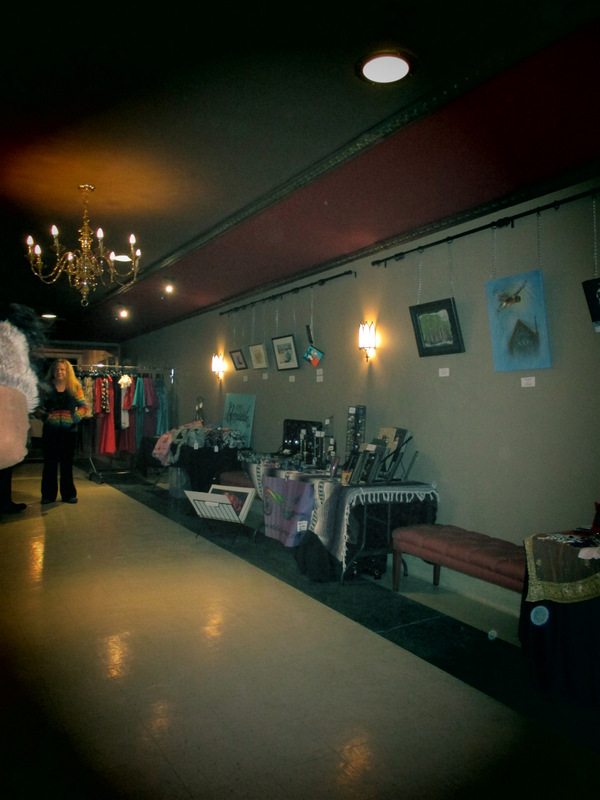 It was a lovely old theatre, and such a fabulous place to see a burlesque show, but as it was this friends FIRST vendor show, it was sort of fun sitting there chatting business. 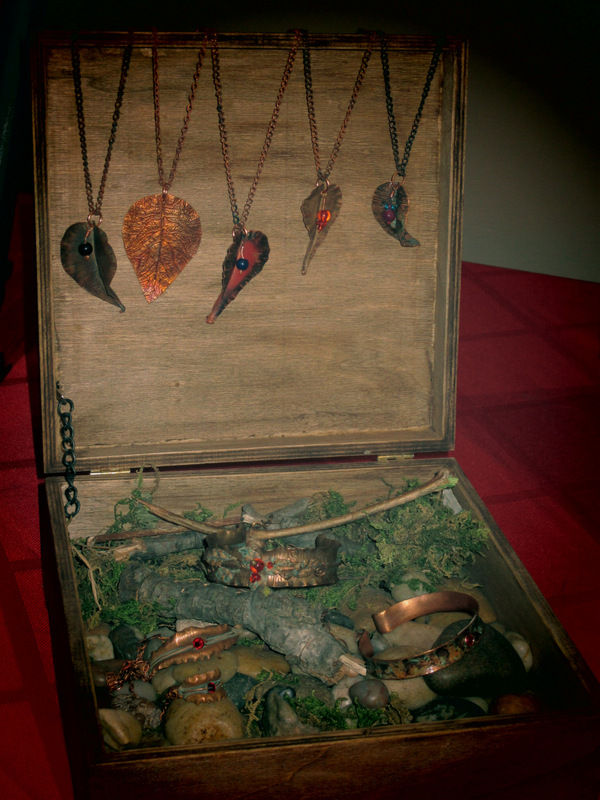 He makes these lovely pieces out of Copper. I designed his logo, Facebook page, as well as his business card…pro-bono of course, since it serves me just as well as him. Maybe this year I’ll actually get up the nerve to do this pro again, will see. If you recall, twas that theatre to which we took Grandma to see The Empire Strikes Back. I also recall you at one point whispering rather loudly to Grandma…”I don’t know Mother, I have no idea what’s going on now either“. We all thought that she’d love it, given she was such a big fan of Science Fiction, at least in theory I guess she was. However, in two-dimensional reality played out on the screen in front of her, well, I think her reared in the 1920’s brain couldn’t handle the sensory overload. The building, the theatre itself, is still somewhat intact and now has a historical designation. And I would imagine is the only remaining downtown theatre’s left that still has its doors open. With cracks in the bathroom tile that could easily date back to the days when Grandma may have visited that very theatre as a young girl, I was enchanted. The bathroom alone is worth the price of admission to the show, with the lovely black and white subway tile motif, and all that gorgeous art deco-esque grandeur within. Myself and another friend came to help out, and while I could have gone in if I wanted to see the show, I actually think I had more fun in the hallway. Not that I’m a prude in any way, ok, well maybe I do have a streak of it. SO that was my night last night. And a good time was had by all, as the faces of the audience attested to. After the libations back at my friends pad, I sauntered home through the darkened London Downtown streets. I know I should be careful Mom, but London is actually rather safe…nothing untoward will happen…and those walks in the air give me time to think. Last eve as I swung past old Mr.Blue.Eyes darkened pad, I turned left onto my street, and I made a decision that the next guy that comes along must meet certain criteria, and the following are non-negotiable. A– Would never walk up to my bookcase of books and say “Did you read all of these?”. B– Would take me out to a Burlesque show, and not say a word at any point in the night about one single individual who attended; except maybe to complement the transvestite on their killer heels, or admire the plus size performers pasties.